If you know me, you know that if you ask me what I want for dinner, there is about a 83.143% chance that I will say Chinese Food. I love Chinese food…really all Asian food, but definitely Chinese food. There was a period of time a few years back that I would literally head to the local Rice Wok Chinese Restaurant in Studio City three to four days a week for lunch. They have the best little lunch special…which if you know about me, you know I am a big fan of a good value! Why do I like Chinese food so much? We never really made Chinese food at home. 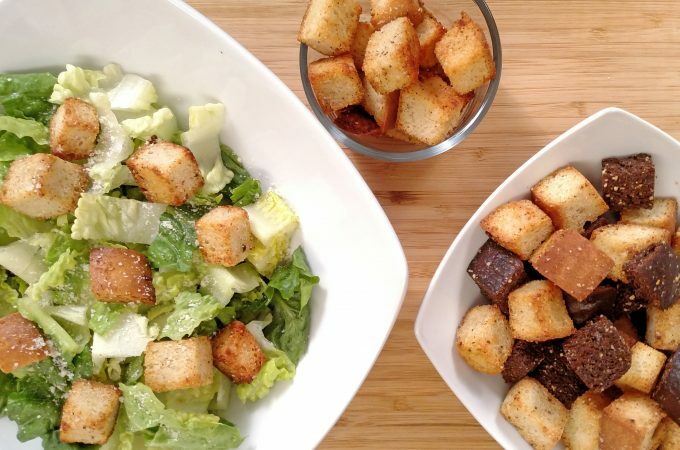 And when we did…well…let’s just say it always tasted so much better at a restaurant. That’s why I wanted to create this recipe. I wanted a solid recipe that I could make at home and get the same satisfaction as I would if I got takeout. In looking at a lot of Chinese dishes, if you were to boil it down to the simplest of terms, it’s a protein wok-fried with vegetables in one of several sauces, served with rice. Now that’s a VERY simplistic way of thinking of it because the tastes and flavors are so much more, but it gives us a basic framework within which we can work to start making one of the great Chinese classics. 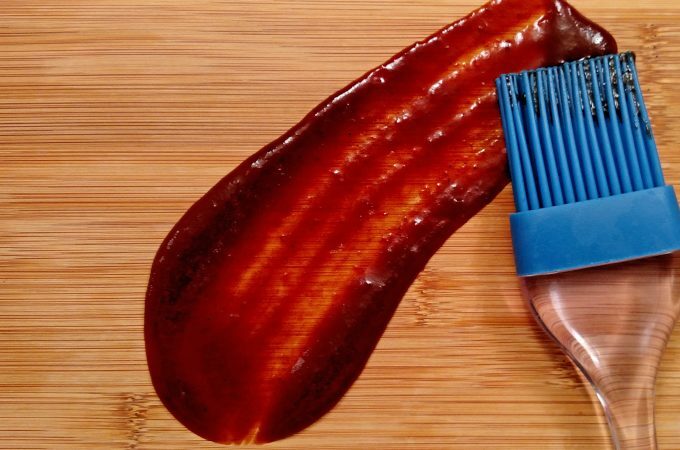 SAUCES are key in Chinese cooking and one of my most favorite of Chinese sauces is a dark brown garlic sauce. It just envelopes all the great ingredients with wonderfully rich garlic flavor. Truth be told, it’s not at all hard to make. Plus, you can make a batch of it and keep it in the fridge for a couple of three days (or even freeze it) for easy stir fry anytime. As for the VEGETABLES, pick your favorites. I just love peapods, broccoli and mushrooms. But use whatever you like. As for the PROTEIN, chicken and shrimp are, of course, great picks! But I wanted to step outside the usual a bit and use Tofu. I was definitely not an advocate for Tofu in the past. I think mainly because people always tried to tout it as a substitute for meat. 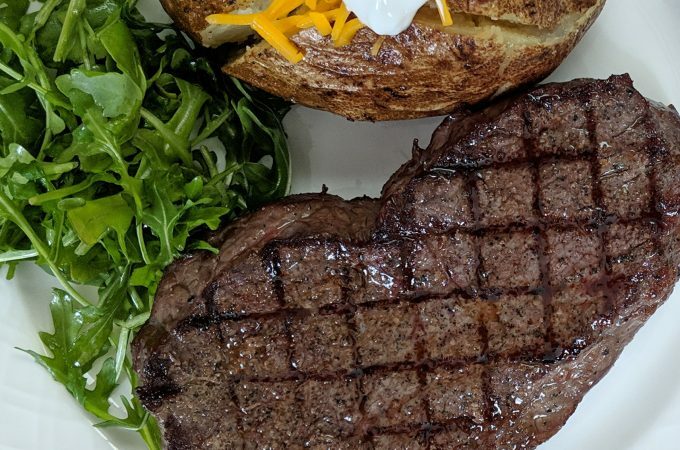 Let’s be honest, it’s never going to taste like a steak, no matter how you try and sell it. And that was my problem. It felt like false advertising and so I never really gave Tofu a second look. Then I had it deep fried. Amazing. It’s got its own unique personality and flavor that if you don’t try and sell it as something its not, then it’s actually pretty good. So in this recipe, rather than deep frying the tofu, I wanted to keep it on the healthier side. So I decided to just lightly crisp it up on the outside by pan-frying it. I find the most successful way to do that is to coat the tofu in oil before you cook it, otherwise it can have a tendency to stick to the pan. One thing to note, in order to get it to brown, you really do want to remove some of the excess water from the tofu, so give it a good 15 minutes to press some of the water out. In terms of seasoning, all you really need is salt. 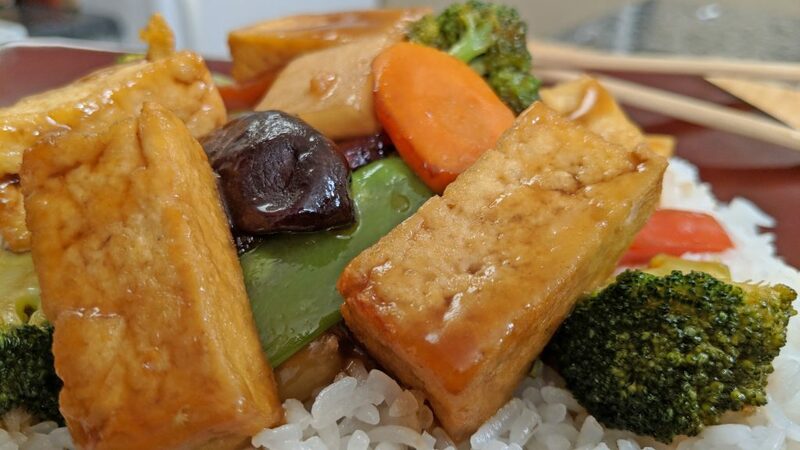 And once pan fried to a golden-brown, the Tofu is lightly crispy on the outside and smooth and creamy on the inside. It’s really good on its own, so you may want to make a little extra to snack on. And that’s it. 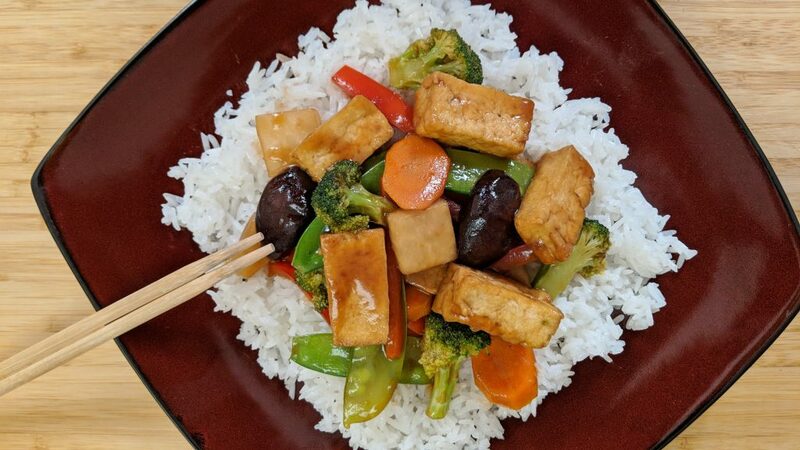 Once you have the tofu, the veggies and the sauce…all you have to do it put them together and make a spectacular Vegetarian Stir Fry. Can’t wait for you to try it with your own vegetable combination and don’t forget to post pictures of your Stir Fry on Instagram. Tag us in them (@tinykitchenTV) so that I can see you’re amazing creation! 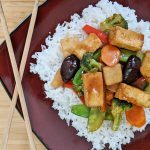 This Stir Fry combines lightly crispy and golden-brown tofu with a perfect mix of crunchy sautéed vegetables in a full-bodied Garlic Sauce. Cut Tofu about 1 inch thick. Prepare the Tofu placing it on a bed of Paper Towels. Cover with more Paper Towels and place a weight on top (Note: a heavy bowl or canned goods work great) for about 10-15 minutes. Cut the ends off the Snow Peas. Cut Red Bell Pepper into 1/4 inch strips. Peel Carrot with Vegetable Peeler and cut at a bias. Cut into 1/8 inch slices. Peel Jicama with Vegetable Peeler and cut into 1/4 inch slices. Cut into small pieces about 1 inch in size. Cut off Broccoli Flowerets and cut Flowerets into bite-size pieces. Remove Tofu from Paper Towels. Cut into rectangular cubes. Place Tofu in Small Mixing Bowl. Add 1 teaspoon Avocado Oil and season with Salt. Mix. Create a slurry of Cornstarch by combining Cornstarch and 2 Tablespoons of room temperature Vegetable Stock. Combine remaining Vegetable Stock with Soy Sauce, White Wine, Sesame Seed Oil, Sugar, Ginger Powder. Tofu: In a Frying Pan or Wok over medium heat, add 2 teaspoons of Avocado Oil. Arrange Tofu in Pan. Cook on all sides until Tofu is golden brown. Remove from pan. Turn heat up to medium high. Add 2 teaspoons of Avocado Oil. Add Broccoli, Red Bell Peppers and Carrots to pan. Sauté for about a minute. While sautéing, add 1 Tablespoon of Water. Add remaining vegetables (Snow Peas, Mushrooms and Jicama). Sauté for another minute or two until vegetable become vibrant. While sautéing, add 1 Tablespoon of Water. Remove vegetables and place on a plate. Turn down heat to medium. Add 1 teaspoon of Avocado Oil and Garlic. Sauté until aromatic. Add Vegetable Stock/Soy Sauce combination and bring to a boil. Turn down heat. Let simmer for 2. While simmering, slowly add Cornstarch slurry until Garlic Sauce reaches desired thickness. Add Vegetables and Tofu to sauce. Toss to coat all the ingredients in the sauce.